NOTE: The board is now available to buy as new version from shop! There’s possibility to make a “Plug’n’Play”-version also, easier to install and not so permanent installation. In my Logo 800 this isn’t mandatory since the unit can be placed so I have access to physical off-switch. In my TRex 500 situation is different. Since I really hateany visible wires and usually crahs with this heli quite a lot the only good place for the unit is inside the frame. 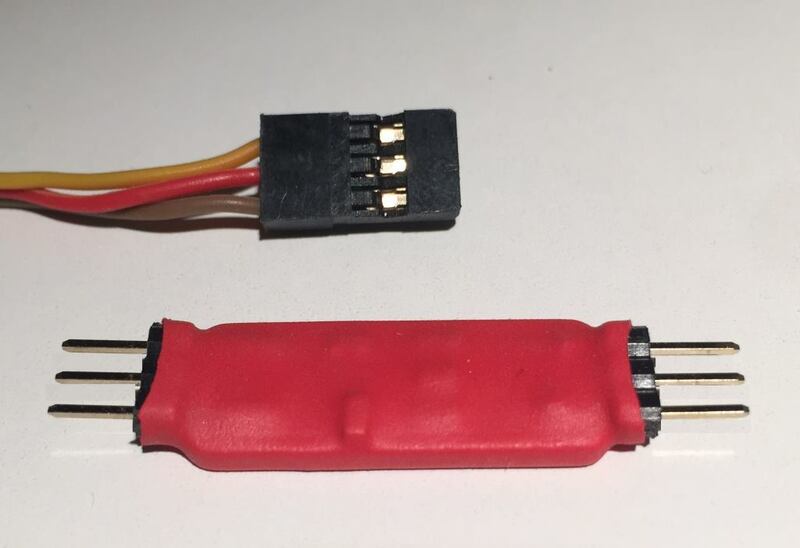 And since the ultra guard’s 2S battery need’s to be disconnected if I’m not flying for a week the placement becomes tricky since the off-switch and lipo-connector are on opposite ends of the unit. This little gizmo let’s me place the ultra guard so I have to have only the battery-connector end visible. I have a dual-hold setup in my transmitter, the “normal” hold I’m using is a two-way switch (Sg). used just as hold-mode is used. I have an additional two-way lock-switch (Sf) I’m using to add safety. When powering heli the “lock-hold” is always on, increasing safety since it’s practically impossible to switch this off unintentionally. I switch this off when heli is ready on the platform to take-off. 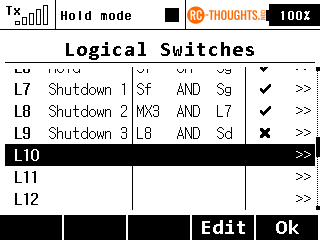 Next needed logical switch is the rule for “If both hold-switches are on and heli is unpowered” (L8), there’s a telemetry switch to take care of that. The rule is pretty straight-forward. 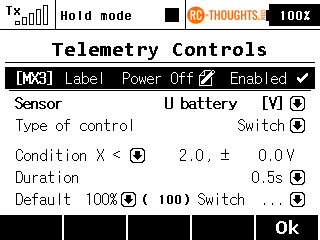 control MX3 is true if flight-battery voltage have been under 2 volt’s for longer than 0,5 seconds. 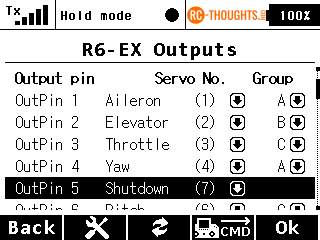 So, now we have the rules, we need to activate the output for about 1.5 seconds. If activated longer ultra guard goes to discharge-mode. 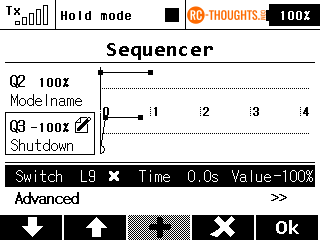 Therefore we need to make sequence. 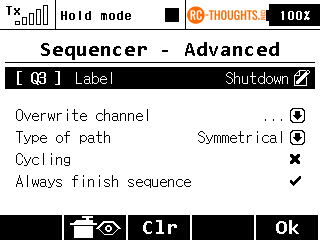 Give the sequence a name, make sure it’s “Symmetrical” and “Always finish sequence” is active. This means when activated sequence start’s from -100, goes to +100 (at 0.1 second’s mark), goes to end (+100 mark at 0,8 seconds) and returns to 0.0 seconds the same way. So now we have a value of -100 that jumps to +100 and stays there for 1,4 seconds before returning to -100. This was the function. All we need to do now is to make sure we have a signal to give for the newly added PCB. 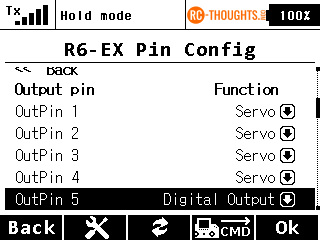 That means we need to make one output of receiver to “Output” instead of the normal “Servo”. 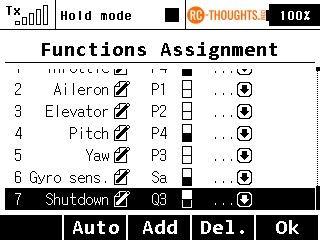 This is simple, make the channel 7 named “Shutdown” to be activated by the sequence You made earlier, in my case Q3. From my understanding of the way the optiguard works, that the optiguard board has a drain on the lipo if the balancing connector is still connnected. I beileve that if I am correct, then the only true way to prevent battery discharge, is the disconnect the battery as well. Please let me know if you think I am correct. A lot of people have posted that the balance connnector must be unplugged if not flying the heli for a long period of time. More than one day. The optiguard drains the lipo battery if it is physically plugged in to the Opti-guard board. You need to devise a method of disconnecting the battery, otherwise battery will still discharge even if the switch is off.